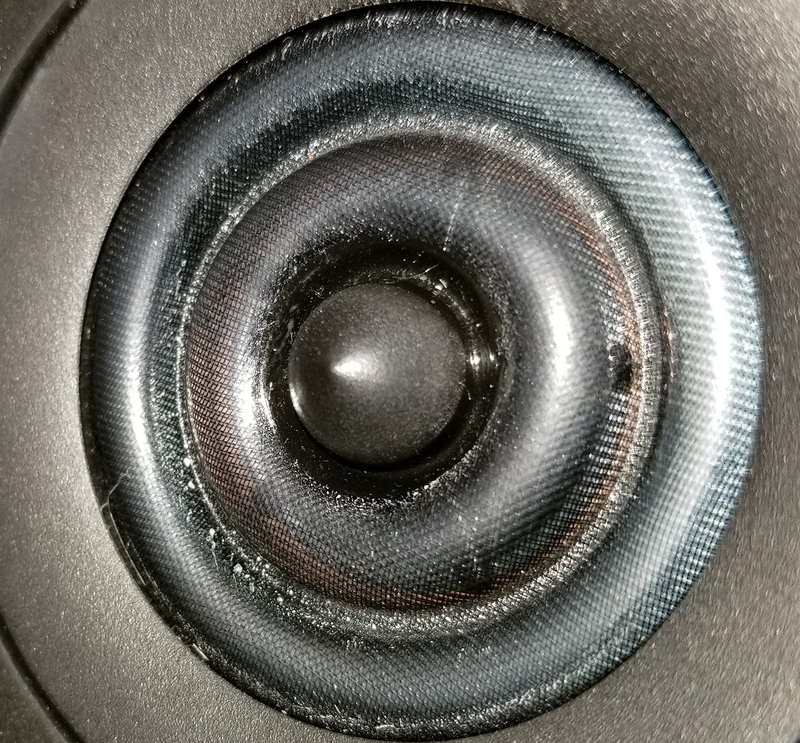 I purchased my 703s directly from Polk and I immediately noticed that one of the ring tweeters had some white schmutz or residue on it in the valley/channel of the ring. The other speaker's tweeter didn't have this. I tried very gently wiping it with a soft microfiber towel, and it would not come off, so I stopped trying. I think it might be something from the white cloth bag that the speaker ships in, as I noticed that it was touching the tweeter when I unboxed it. 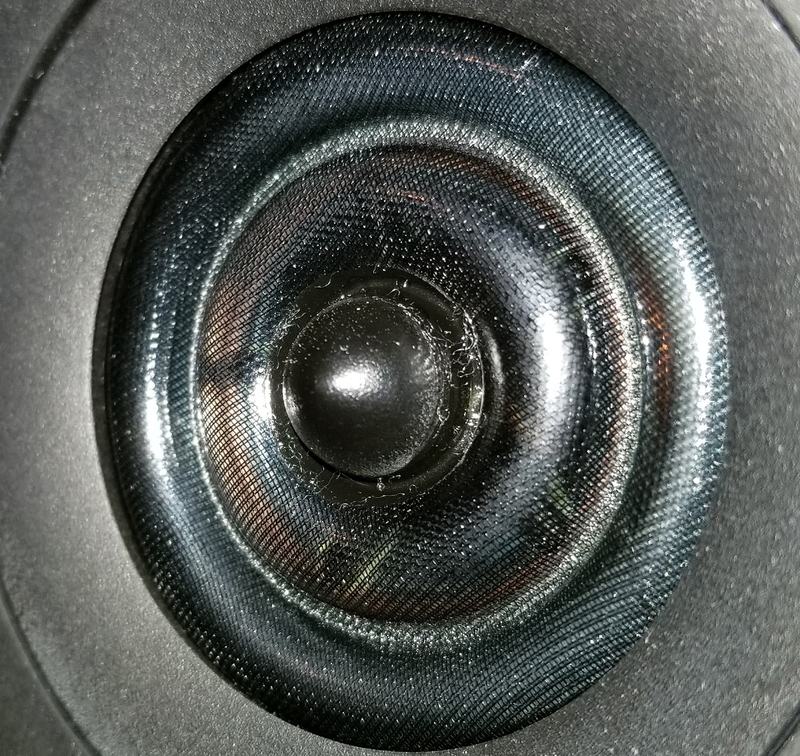 So maybe the speaker was packaged when the tweeter was still sticky for some reason and then it got some of the fibers of the white bag stuck to it? Or maybe just the fact that it was in contact with it through the shipping process and being exposed to various temperature changes caused it. 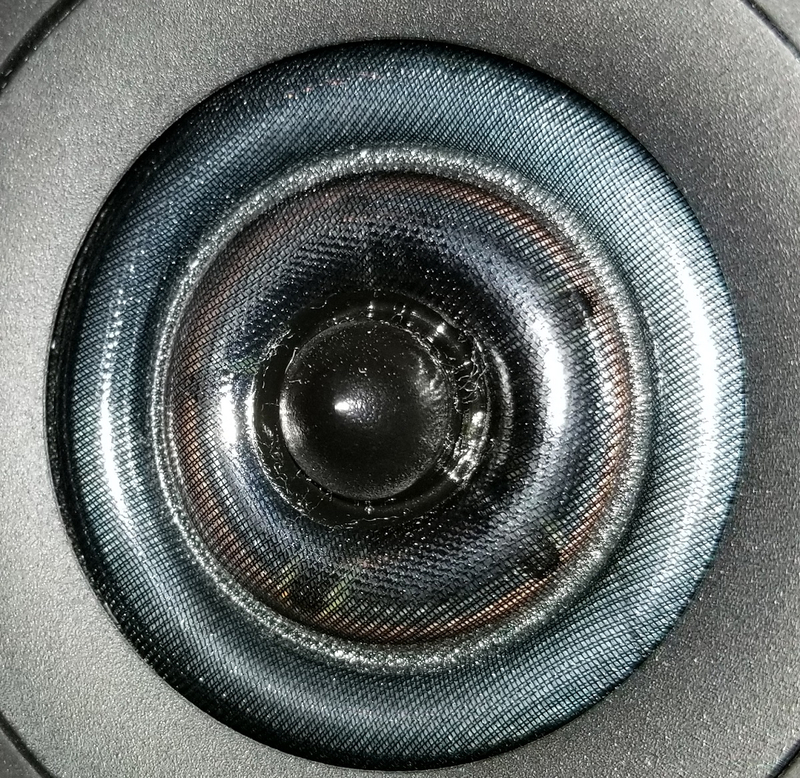 Or perhaps I just got "unlucky" and they came like this from the factory - if you look closely on the second photo of speaker A, you can see that there's also some residue on the soft rubber trim that surrounds the tweeter. Anyway, not a huge deal as it doesn't seem to be affecting the audio reproduction, but just figured I'd show it alongside the other one and see what everything thinks. I think you need to consult someone who speaks Yiddish. Try a firm paint brush to remove it. Thanks, I'll try this but it seems fairly stuck on there. Do you know if the sound is actually coming from the black rings/waves, or if it's coming from behind it? Maybe some Windex on a q tip? Is that safe for that material of the tweeter? Didn't want to put anything wet on the tweeter. If a brush won't get it then a damp Q-Tip as stated would be fine. Even better would be one of those foam eyeshadow brushes. I grew up with Mom and two Sisters now I have a Wife and Daughter. Some of their makeup tools are handy for projects. I haven't done anything yet, I'm just super tentative to try to use any sort of liquid or exert any pressure on the rings of the tweeter. After paying this much for these I'm just a bit gun-shy. I actually emailed Polk CS about this and sent the same pics just to see what they have to say. Worst case scenario I just keep the grills on and forget it's there? Yes, by all means...if you don't feel comfortable doing it, then just leave them alone. In most cases there is not a major risk if one is careful however you don't want to be the one to damage a new set of speakers. See what Polk says and if they won't replace it then just try to ignore it. The truth is, many dome tweeters collect dust anyway if you leave the grills off. So at some point they need to be blown or suctioned off. Else they will look just like yours or worst! I've not yet heard anything back from Polk CS regarding this, I sent them the email on 12/26. 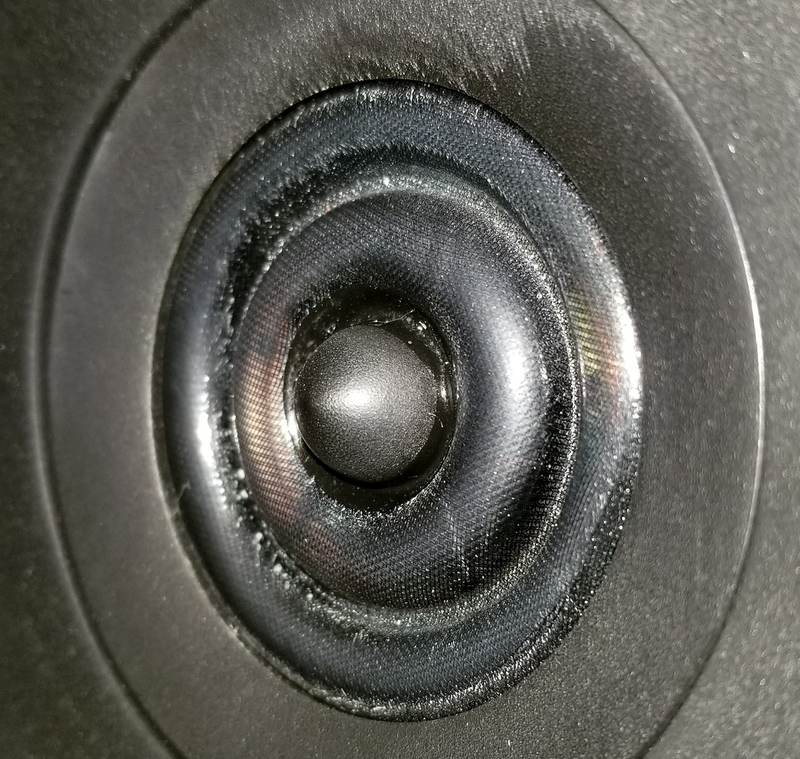 FWIW the rubber surrounds on my 705 towers were cleaned (gently) with Windex and a soft cloth as has been mentioned just prior to my purchasing them and have suffered no ill effects. I do understand your hesitance to try it, don't get me wrong, but I've seen it mentioned here many times as the "go to" solution for white schmutz. I understand for the surrounds, but I'm hesitant to put any cleaning liquid on (what I'm presuming to be) the delicate tweeter material that actually makes the high frequency sounds. It's not as delicate as you think. Try the Windex. One thing I'm still unclear on, does the sound actually originate from the black material with the two rings/ridges/waves, or does it come from what appears to be a copper colored drive unit behind it? You are confusing that with chicken fat. I emailed them again on 1/17 and never heard back, so I just emailed them today for a third time regarding this. I could try calling, good point. But they could also try replying to an email sent nearly 3 months ago. The last time I saw sticky stuff on my tweeter...well, nevermind. Schmutz on the ol' tweeter eh.....Was Russ in your area recently ? Finally got a response from Polk CS to my inquiry about this that I sent on December 26th! It only took them ~2 months to reply! That is nothing I have seen before. I am not sure what could have caused it. If you have any questions or concerns you can give us a call at 1-800-377-7655 so we can get you the assistance you require.